Note the guy in the Trilby, Left - that’ll be Ralph Ferrie. Note the registration on the newer Rolls… RF 2. Picture supplied by an anonymous reader. Further to my previous post, enquiring after noted local businessman Ralph Ferrie, the anonymous reader who supplied the original clipping has once more come forward, as it appears they forgot to include this image with the article. 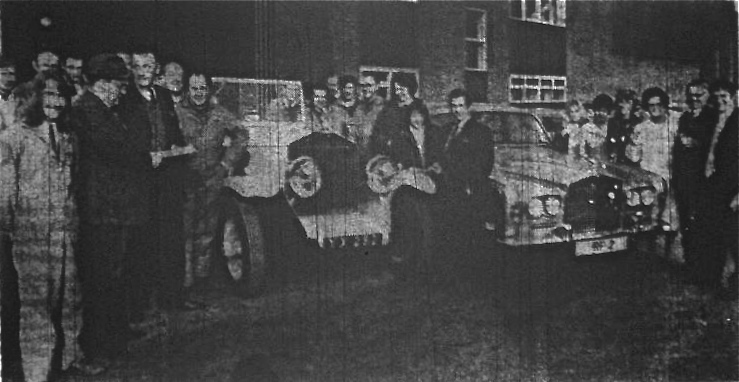 I’m not sure is this shows Brownhills Motor Sales workers or those of McNeillie who renovated the car, but that’s certainly Ralph in the hat. I’d be intrigued to know who the long haired guy in the overalls and tie with the big, cheesy grin next to them is, too. Cheers to anonymous, and if anyone has anything else to add, please do. Still very short on Ralph material… but there have been good contributions from David Oakley and David Evans. lease, do contribute if you can. This entry was posted in Brownhills stuff, Environment, Events, Features, Followups, Interesting photos, Local History, Local media, Reader enquiries, Shared media, Shared memories, Social Media, Walsall community, Walsall Wood stuff and tagged Brownhills Commercials, Brownhills local history, Brownhills stuff, Clayhanger stuff, Donisthorpe, Features, Interesting photos, Local History, Local media, McNeillie, Ralph Ferrie, Reader enquiries, renovation, Rolls Royce, Shire Oak, Staffordshire, Tesco Development, Walsall Wood. Bookmark the permalink. That is indeed a picture outside Mcnellie’s when the ‘yellow and blue’ Rolls Royce was finished and handed over to Ralph Ferrie, I remember it well as I was there . Does anyone remember the vintage fire engine he also owned? Think I’ve got a photo of it somewhere. The 1929 vintage Rolls he used to lend out for weddings, Ralph used to just ask for a donation to the Megan du Boisson handicapped centre, in Walsall Wood (since closed down I think) which he actively supported. There must be people out there who rode in the Roller to their wedding and have photos? please can readers confirm where Brownhills Motor Sales was located.. was it connected with the old railway station business in Walsall Wood? or the car sales in the High Street..now the medical centre in Walsall Wood? I believe Brownhills motor sales was located at the back of the Station hotel Brownhills, then it moved to the old premisses of the coppy pit Walsall Wood later on. Brownhills Motor Sales Ltd. started life at Station Garage, behind the Station Hotel in Brownhills, it then moved/expanded to a site on the A5 into what once was a railway yard (by where the railway bridge is/was near to the Rising Sun.Here there was a garage and petrol station. Ralph then bought Walsall Wood Colliery as the land on the A5 had to return to common land. Here the business grew/expanded until he retired from the business in the mid 1970’s when it was sold to Tarmac Ltd. Ralph continued to own the land/buildings behind the Station Hotel and when this site was sold after his death in 1982, and then built upon, Ferrie Grove was named after him there. There was also a car showrooms at Streets Corner for a while (by the school) at the corner, in the mid 1950’s. The site having previouly been a green-grocers I think. Hi Tone did you work for Ralph Ferris when it was on the A5 if so did you know Bill Withers or bigTony ?